Celebrating the Great British Banger! 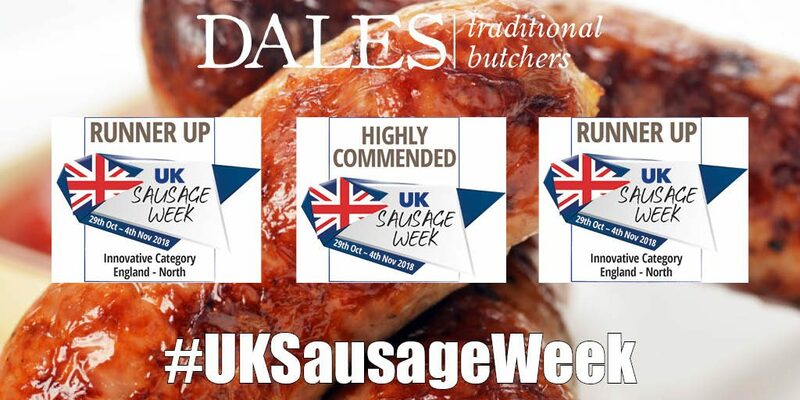 As you’d expect, we’re always happy to join in the celebrations for UK Sausage Week here at Dales Butchers. We’ll have 20+ sausage varieties on offer throughout UK Sausage Week, including several gluten free options and a good number of our previous award-winners. Organised by the team over at Meat Management Magazine, UK Sausage Week is an opportunity for the whole of the meat industry to get behind one of the nation’s favourite culinary delights and to celebrate the fabulous versatility of the ever popular Great British banger. Although we’ve previously been fairly successful when it comes to receiving awards for our top quality bangers, I’m afraid we didn’t have any winners this year. However, we did get a couple of runner up postions for our Chicken, Black Pudding & Thyme Sausage, and also for our Lamb and Apricot Sausage. In addition to these we ralso received a ‘highly commended’ for our traditional pork sausage. We’ll try harder next year! In the meantime, you don’t need to wait for another UK Sausage Week to come back around. As always, our sausage making will be continuing unabated and we invite you to come in and give something new a try. Previous Post Previous Post: JOIN THE TEAM! Copyright © 2019	Dales Butchers. All rights reserved.